I made date balls, chocolate dipped pretzels and chocolate peanut-butter oatmeal cookies tonight. Yum!!!!! Aw, how cute is she? 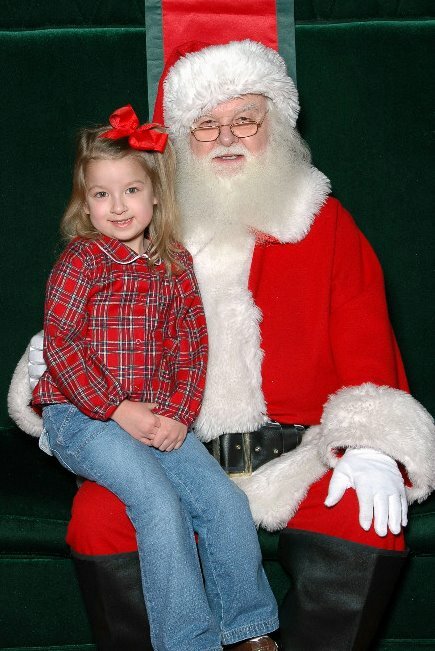 That Santa is pretty cute too. Merry Christmas Tracie! Beautiful!!! What a great picture! Great photo! We stood in line for an hour and 45 minutes. Kennedy was wide awake the entire time. Then we were finally #2 in line and her head hits my shoulder and and was OUT cold. So, I got a picture of her alseep in Santa's arms with his finger to his lip for everyone to be quiet. I'll have to scan it in. Very cute! Merry Christmas to you and your family:)!! Does anyone else think she looks a lot like her daddy in these pics?